Strabismus – The most common cause of amblyopia is strabismus, a misalignment of the eyes. To prevent the double vision caused by strabismus, the brain ignores information from one eye. Unequal Refractive Errors – Refractive amblyopia occurs when the brain favors one eye due to extreme nearsightedness, farsightedness, or astigmatism in the other eye. Vision Obstruction – Called deprivation amblyopia, this type of lazy eye is caused when an infant’s vision is obstructed and hindered from normal development. 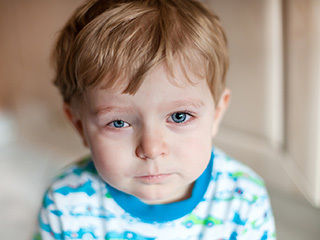 Congenital cataracts typically cause this type of amblyopia, and require surgery for treatment. In some cases, a misalignment of the eyes will be apparent. To test infants at home, a parent can try covering one of the child’s eyes at a time while observing behavior. If the infant consistently fusses or cries when one eye is covered, this might indicate a vision problem. Since amblyopia most commonly affects only one eye, children will also consistently bump into objects on the affected side.